We all long for community and friendship. As we are called to union with Christ and with one another, community and friendship are two things that Christians cannot live without, but we can easily experience a void when it is absent. How do we cultivate stronger communities and stronger friendships in an ever-changing environment? What does the Bible teach us about true community and a lasting friendship? 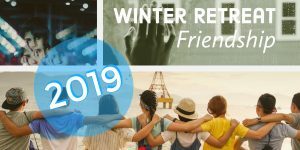 Join us for this year’s Winter Retreat from January 4-6 in Downtown Baltimore at the beautiful Hotel Indigo to talk about these issues, worship, and fellowship together. There will be opportunities for exploration downtown, fun together, and getting to know our church community more. Session 4 – Sunday morning @ CPC at 9:30am for January’s Winter’s Lecture Series and worship at 10:30am. Cost covers two nights lodging and materials. Cost will not cover meals, free-time activities, or parking (a parking garage is directly across from the hotel). Don’t let cost or stage of life be a barrier. We are working to provide child care during meeting times. Early Bird – $20 automatically off for registrations submitted before 11:59pm on December 5, 2018. If you and your spouse are both attending and want to be roommates, please choose the “single room” (meaning you will share a room with your spouse) for each of you after clicking “register now” below. The discount is automatically calculated at the end of the form. If you and your spouse each register for a Quad Room (meaning you will each share a different room with up to 3 others i.e. (girls with girls and guys with guys)) then a discount is automatically calculated at the end of the form. We prefer spouses select this option so spouses with small children or infants can have their own room.